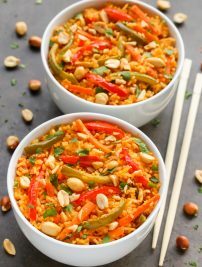 This Thai Spicy Chicken and Rice recipe makes a balanced, filling meal that is bursting with fragrant Thai flavors. A perfect dinner for busy weeknights that the whole family will love! 1. Brown the Chicken: Start by seasoning the chicken in a bit of salt of pepper. Then, using a pair of tongs, add the chicken pieces to a hot, oiled pot. Let the chicken cook for a few minutes, then flip it over and cook the other side. Once the chicken is golden-brown on all sides, remove it from the pan and set it aside. Tip: The chicken pieces are ready to be flipped over when they release easily from the pan. 2. Start the Vegetables and Rice: In the same pot, sauté the vegetables, then add in the garlic, ginger and curry paste. Stir in the broth, coconut milk, fish sauce, brown sugar and rice. Allow everything come to a simmer. 3. Let the Chicken and Rice Finish Cooking: Add the chicken back to the pot and cover it with a tight-fitting lid. Leave it alone to cook until all the liquid has been absorbed by the rice. Stir in the lime juice at the very end. Then, you can serve the dish with some cilantro and lime wedges, if you want an extra burst of freshness and flavor. Tip: Use a meat thermometer to ensure the chicken is cooked through. The chicken should reach an internal temperature of 165ºF (74ºC). Pot/Dutch Oven – This one is super affordable and the quality is excellent. I love also using it to make soups, stews and chili. In a large pot, heat the oil over medium-high heat. Cook the chicken for about 5 minutes, until it begins to brown and releases easily from the pan. Flip the chicken over and cook the other side for an additional 5 minutes until browned. Transfer the chicken to a plate and set aside. Add the carrots and bell pepper to the same pot. Sauté for about 3 minutes, until slightly softened. Stir in the garlic, ginger and curry paste and cook for another minute until fragrant. Stir in the broth, coconut milk, fish sauce, brown sugar and rice. Bring mixture to a simmer. Return the chicken to the skillet. Reduce the heat to medium-low, cover and cook for 15 to 20 minutes, until all of the liquid is absorbed and the chicken has reached an internal temperature of 165ºF (74ºC). What gorgeous photos Alia! 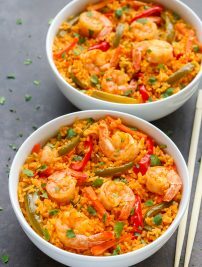 This looks like such a vibrant, flavorful dish, and I love that it seems quite simple to prepare too. I love anything Thai! This looks so good! !